CORONA, Calif. -- A woman and her husband were surprised Christmas night by a Caltrans sign in Southern California that didn't look quite right. 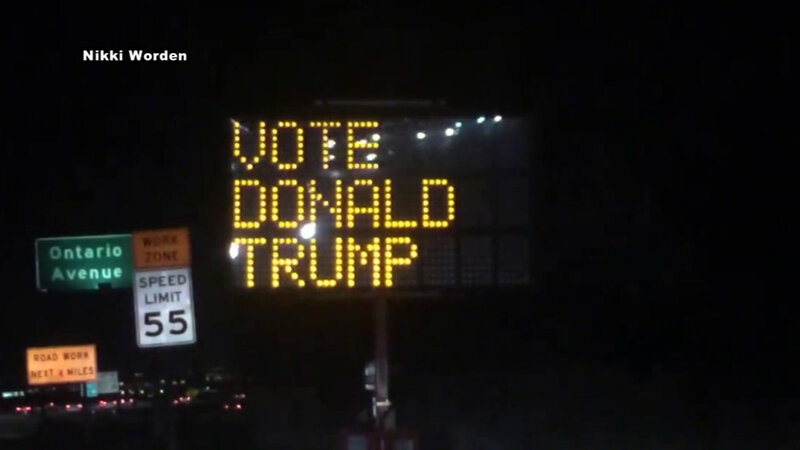 A Caltrans spokesperson said someone had apparently reprogrammed the northbound 15 Freeway sign at Ontario Avenue in Corona to read: "Inland Empire supports Donald Trump. Merry Xmas. Vote Donald Trump." As opposed to its usual traffic warning, the sign with the Trump message was clearly visible to thousands of passing motorists for an unknown period of time. Nikki Worden and Dann of Corona were returning home from the movies when they said they couldn't believe what they saw. So, they decided to get off the freeway and pass it again while recording it on video. After Worden posted the video on Facebook, the post received over 260,000 hits from people viewing and sharing her video. On Sunday, the display was back to its original traffic message.